Anxious thoughts are (arguably) the least pleasant kinds of thoughts—and as soon as they pop up, your main goal is to get them gone. And while you can’t necessarily stop yourself from ever having them, you can learn how to manage them, and prevent them from going rogue—that’s where meditation comes into play. Still, it can be hard to know where to start—and what to do when you’re actually feelinganxious. 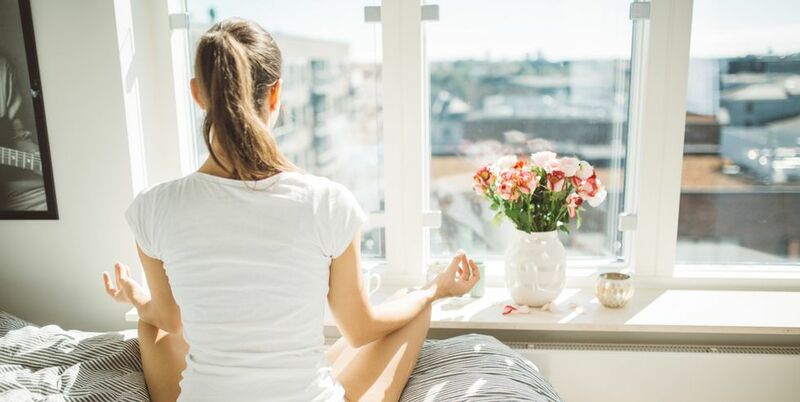 Try one of these seven quick meditation tips for anxiety to help bring yourself back to reality. 1. Focus on the rising and falling of your breath. With your hand on your stomach, focus on your breath as you inhale and exhale. Count your breaths—“one” on the rise, “two” on the fall—as you pay attention to the movement of your body, to bring you back to the present moment, suggests Puddicombe. Do this for 10 seconds, he says, repeating if necessary. 2. Pay attention to how your feet feel on the floor. Or how your hands feel on your keyboard; or how your back feels against the chair—anything that grounds you to where you are and what you’re doing at that very moment. Allow thoughts to come and go as you normally would (because they will—meditation isn’t void of thought), but as soon as you realize you’re lost in the thought, pivot your thinking back to the sensation you were focusing on, says Puddicombe. 3. Do a full-body scan, starting at the top of your head. Don’t pass judgement or fixate on any specific feelings—just make a note of it and move on; scanning your entire body two to three times, paying attention to how you feel before versus after the scan is complete. 4. Imagine bright, warm sunlight shining down above your head. 5. Let your mind think about whatever it wants to think about. 6. Picture someone you love—and breathe in their anxieties. All right, this one sounds weird, but just go with it. Hold an image of someone you love in your mind, and imagine yourself taking on their anxieties and insecurities with every inhale. On the exhale, think about all of their good qualities and the great times you’ve had together—kind of like breathing in the bad and breathing out the good. This exercise of putting the happiness of others before your own is called “skillful compassion” according to Puddicombe. “One of the most effective ways to let go of a strong emotion such as anxiety is to focus on another person,” he says. 7. Talk to yourself like you’d talk to a friend. Ask yourself, “What do you appreciate most in your life?” Once you’ve got something (or things) in mind, dwell in that gratitude for 30 seconds.